Being that I am passionate about beer, I wanted to learn more about the beverage I love. The opportunity to take my knowledge to the next level, as well as gain a certification as a beer connoisseur, came up with the Prud’Homme Beer Certification Class Level 1 taught by the VERY knowledgeable Ken Beattie. I was able to join a small group of like-minded people in four x three-hour sessions, every Saturday to learn about the intricacies of beer, as well as have an in-depth tasting at the conclusion of each class. It was a great mix of people attending the sessions, industry professionals as well as others who were genuinely interested in learning about their favorite drink. Each class covered different areas of beer, from the history and brewing process of beer to proper glassware and keg/tap maintenance. Even as someone who is constantly reading about beer and the industry, I was able to take away lots from this class – Do you know what an Ale Conner is? I didn’t! There are two beer certifications vying to be established as the dominant certification right now, Cicerone and Prud’Homme. 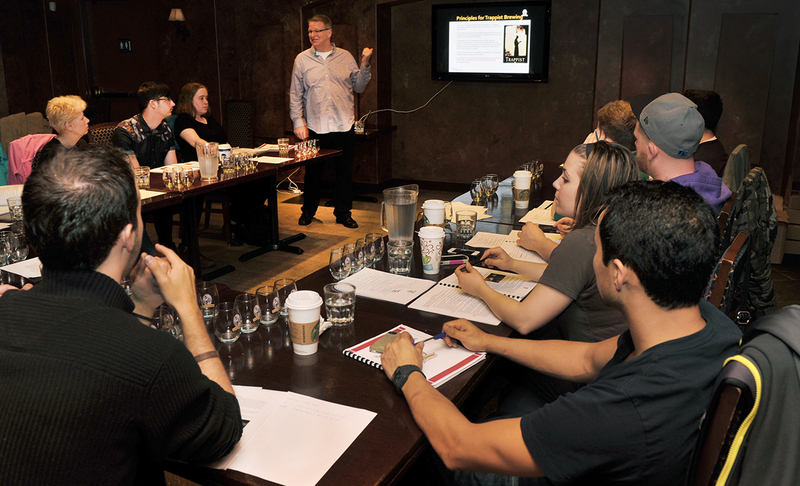 The Cicerone course is much more expensive and upon completion you don’t receive any sort of certification; with Prud’Homme you come out with a certification, and save money as well. Also, I can’t say enough good things about the leader of the course, Ken Beattie. He was so knowledgeable and passionate about the course teachings that it made learning about beer even more fun than I thought it could be! Long story short, is if you are interested in growing your knowledge of beer or are interested in working in the beer industry, I highly recommend attending the Prud’Homme courses. I am already planning on attending the level 2 session in the fall! For more info you can find Ken on twitter at @EurekaBeerGuide and you can visit the Prud’Homme website here. The Cicerone Certification Program provides online training for our first level, Certified Beer Server, via BeerSavvy. The cost of this online training also includes the exam for the Certified Beer Server level. Now, the Cicerone course you may be referring to is individuals holding their own beer education classes to prep people to take the second level of the exam to become a Certified Cicerone. JP thanks for your clarification , the blog you are referring to was written by a student who had taken the course and the opinions expressed in that post are his own views.I am aware of the Cicerone certification and you are correct in explaining the blogger was referring to a course taught as a prep class without certification by Cicerone and not for the online version and subsequent exam.